Cruises to Greenland are an adventure for the senses. They combine barren wilderness and expansive flora, massive mountains and vast glaciers. From helicopter rides that land on glaciers, to boat excursions that guarantee an unforgettable adventure experiencing huge icebergs and fantastic flora and fauna, Hurtigruten takes you on adventure cruises to Greenland that are utterly amazing and completely unforgettable. Greenland is 836,109 square miles of enormous icebergs, beautiful fjords, and majestic mountains. We invite you to explore it on a unique adventure cruises to Greenland. Expeditions ranging from 8-18 days, include dozens of opportunities to disembark and take in this vast, wonderful land. Partake in short excursions or full day expeditions. Each port of call is filled with remarkable adventure and dozens of chances for self exploration. The Disko Bay 8-day cruise to Greenland begins in Kangerlussuaq, Greenland where you will transfer to the MS Fram and then PolarCirkel boats to start your adventure. The next six days will be filled with unique opportunities to experience the Inuit culture, view icebergs, sea life and so much more. From Sismiut to Uummannaq-Ukkusissat, to your final Evighedsfjorden adventure, your days will be filled with unparalleled expedition opportunities. Touch a glacier, fly above the clouds on a helicopter trip, explore on your own or enjoy a guided walk through small fishing towns and quaint villages. This 18-day expedition program is one of the best ways to observe natural wildlife. See musk oxen, whales and seals, abundant bird life as well as unique Arctic flora in the land of the Midnight Sun. 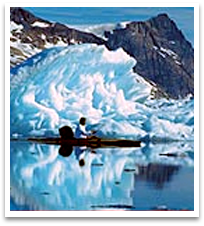 Partake in a city walk in Sismiut, or enjoy an optional excursion on the Lyngmark Glacier in Quqertarsiaq. You may choose to hike to Sermermiut in Illulissat, or cruise the fjords on a Red Desert Sail in Uummannaq. These are just a few of the optional excursions that will enhance your adventure as you visit many exciting ports of call. The Reykjavik-Kangerlussuaq 18-day expedition from Iceland to Greenland features lectures by expert guides and PolarCirkel boat landings and excursions. This cruise includes lectures at sea on topics related to the history and wildlife of the area. For more information, sailing schedules and prices, or to make a reservation today, please contact our Greenland specialist Margreet Pettersen. Margreet may be reached at 206-780-5010 or Click here to email Margreet.